DALIAPOUR (IRE) (Bay 1996-Stud France 2003, Aust. 2011). 7 wins-2 at 2-from 1600m to 2800m, Epsom Coronation Cup, Gr1. Half-brother to SW Dalampour. Sire of 185 rnrs, 92 wnrs, inc. SP Bassel, Lac Majeur and of Lenka Top, Kanotier, Zaliapour, Sun Zephir, La Grande Dame, Zemiro, Daliamoon, Sage Riquet, Secundus, etc. His oldest Aust.-bred progeny are 3YOs and inc Vegas Beauty, Keep the Justice, Return to Justice, Rich Beauty, Value of Justice and of the placegetters Moment of Justice, etc. COLLEGE BEAUTY, by Spectrum. Placed in Aust. Dam of one named foal. Secret Liberty. 3 wins at 1000m, 1200m to 2015, Singapore TC Kranji D S., Class 4 H., 2d Singapore TC Class 4 H., 3d MRC (Mornington) Bayside Jeep H., Singapore TC Exaggerate S.
Keep Ahead. Winner at 1450m in Aust. MATRICULATE (Honor Grades). 9 wins. See above. Charted. 8 wins from 1400m to 3000m, A$212,650, MVRC Member Equity Bank Challenge Final H., Ramvek H., Limerick Lane H., SAJC Skycity Adelaide H., Bendigo JC Country Showcase Summer Series H., 2d MVRC The Track H., SAJC Allan Scott Park Morphettville H., Colac Gold Cup, MRC Australian Hurdle, 3d MVRC Melbourne Exhibition H., VRC George Watson Novice Hurdle Final, MRC Time & Tide H., Captain Peri H., MVRC Limerick Lane Thoroughbreds Trophy H.
SAVOIR (Sovereign Edition). 7 wins-4 at 2-from 1000m to 2000m, NZ$1,500, A$79,580, VATC One Thousand Guineas, Gr.1, VRC Wakeful S., Gr.2, MVRC Ailsa H., VATC Corinella H., Roseberry H., 2d VRC Oaks, Gr.1, Moonee Valley S., Gr.2, VATC Sandown Guineas, Gr.2, 4th ARC Owens S., Gr.3, Te Aroha JC Thames Valley S., Gr.3. Producer. ON THE BEACH (Famous Star). 14 wins-1 at 2-from 1100m to 1650m, NZ$227,635, A$46,100, ARC King's P., L-twice, 2d WRC Captain Cook S., Gr.1, ARC Bluebird Foods Trophy, Gr.2, Clifford P., Gr.2, 3d ARC Auckland Classic, Gr.1, Waikato RC International S., Gr.1, Cambridge JC Dulcie S., Gr.2. Producer. GARUDA (Crested Wave). 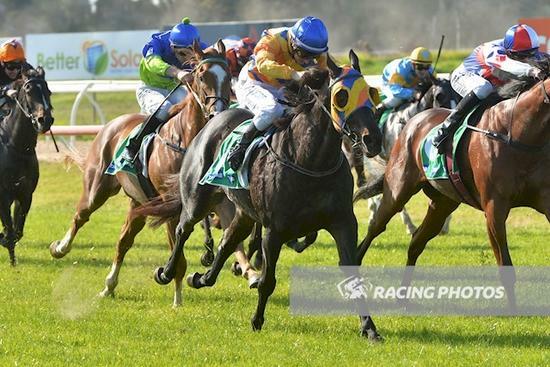 7 wins-1 at 2-from 1200m to 2050m, Wanganui Guineas, L, BTC QHA A Shout for the Mater H., QTC Henry Thompson H., WRC Crown Meat Export H., 3d Whangarei RC Auckland Thoroughbred Breeders' P., L, QTC Curragh Welter H.
SURPASS (Savabeel). 7 wins from 2000m to 2400m, NZ$163,700, A$179,880, to 2014-15, Waikato Gold Cup, Gr.3, ATC Randwick City Mayor's Cup, MRC Slickpix H., MRC (Mornington) There's No Better Bet Than a Sportingbet H., Taumarunui RC Joe Bradley H., 2d ARC City of Auckland Cup, Gr.3, MRC (Mornington) RM Ansett Classic, L, 3d Matamata RC Kaimai S., L, 4th TRC Hobart Cup, Gr.3. IN STYLE (Fast 'n' Famous). 8 wins to 1300m, NZ$293,825, A$3,750, to 2015-16, ARC Railway S., Gr.1, Concorde H., Gr.3, Counties Bowl H., L, Matamata RC Norwood Farm Machinery Centre H., ARC Brand Protocole H., The New Zealand Herald H., BOP RC Bayleys Country H., 3d Hawke's Bay The Desert Gold Club H.
MR CLANGTASTIC (Clang). 9 wins from 1600m to 2400m, A$477,760, AJC Colin Stephen H., Gr.3, Wyong Gold Cup, L, STC De Bortoli Wines H., AJC Ike's Dream H., San Domenico Raceday H., Australian Hotels Association H., MVRC NHP Electrical H., STC Rosehill Gardens Events H., 4th Hawkesbury RC Rowley Mile, L.
MR DEXTER - SUPER TRAVELLER (H.K.) (Danasinga). 8 wins from 1200m to 1600m, NZ$51,875, HK$2,379,750, CJC Timaru S., L, HKJC Jebsen Cup, Audemars Piguet Royal Oak H., CJC First Sovereign Trust H., Canterbury Equine Clinic H., HKJC Calla Lily H.